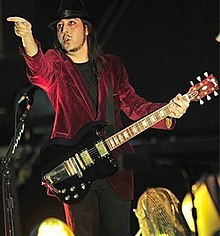 Daron Malakian (born July 18, 1975) is an Armenian-American musician. He is best known for being the lead guitarist of System of a Down. He was also the lead singer and guitarist for Scars on Broadway. He is the only member of System of a Down who was born in the United States. He placed 30th in Guitar World's "100 Greatest Heavy Metal Guitarists Of All Time". Malakian was born in 1975. He was the only child of Vartan Malakian and Zepur Malakian. He first started playing guitar when he was 11. He says his main inspirations were The Beatles, Metallica, Slayer, The Who and Iggy Pop. Daron met Serj Tankian in 1993. System of a Down was formed in 1994. Shortly after Scars on Broadway's first album was released, Daron cancelled all of the band's tours and TV appearances, saying that his "heart wasn't up to touring". Before the band announced the actual reason, there were many rumours about Daron's health, but these weren't true. ↑ 1.0 1.1 Lancaster, Mike (March 28, 2003). "The Daron Malakian Interview". Glendale High School Newspaper. Retrieved 18 November 2014. ↑ "GUITAR WORLD's 100 Greatest Heavy Metal Guitarists Of All Time". Guitar World. BlabberMouth.net. January 23, 2004. Retrieved November 19, 2014. ↑ Gowing, Liam (March 2, 2006). "His son has got him covered". Los Angeles Times. Retrieved 19 November 2014. ↑ "SCARS ON BROADWAY's DARON MALAKIAN Has 'Compelling Reasons' For Cancelling Tour". BlabberMouth.net. October 9, 2008. Retrieved 23 November 2014. ↑ Childers, Chad (June 4, 2014). "Linkin Park Unveil Lyric Video for 'Rebellion' Featuring System of a Down's Daron Malakian". Loudwire. Retrieved November 18, 2014. This page was last changed on 3 September 2018, at 08:08.